poha recipes. beaten rice recipe collection. Beaten rice or Poha is nothing but flattened rice. Rice is first parboiled and then rolled and flattened out to get poha. Poha can be of varying thickness depending on the amount of pressure that is applied while and this thick or thin poha is then used to make various dishes as a main ingredient. Poha is mostly used in the Indian Subcontinent and other south Asian countries. Apart from the classics like Batata Poha or kanda poha and chivda, there is a lot of variety that can be produced with this ingredient ranging from breakfast and snacks to dinner. Given below are a few Poha Dishes recipes that you can easily make. There are many a times we do not want to prepare a lot for breakfast. So making simple poha recipes like Poha dhokla ( look at recipes videos of Poha Dhokla) are the best way to start your day as it hardly requires any preparation time and does not even need fermenting, which is generally required while making dhokla batter. Every Indian has had idli for breakfast or atleast craved those soft, fluffy delights but not gotten the fluffiness. One secret to get fluff is poha. Adding poha to Idlis gives them bounce and makes them delicious! For someone looking for an easy to eat and different recipe, Poha cutlet recipe is the way to go. Flavored with yellow moong dal, spinach and chillies, it makes the perfect breakfast snack that pleases every one. And the best part, you can improvise on the go by adding vegetables you like. Sprouted Matki Poha makes a nutritious breakfast too with the goodness of matki, which provides various vitamins and minerals. Veg Poha is most commonly used in breakfast or snack recipes in India but it can also be used to make dishes for lunch/dinner or great for lunch box. The most common main dish made with poha is dosa! The batter for Poha dosa takes some time to make but it is worth it as it provides both softness and crispiness to the dosa. A variation of this dosa can be made with yellow moong dal with the addition of coconut, ginger, chillies and methi seeds as well. This Poha Yellow Moong Dal Dosa tastes different yet amazing. For a lighter, and healthier, a lunch/dinner option, replace the potatoes in batata poha with fiber rich green peas to make Green Peas Poha. Don’t forget to add a squeeze of lemon to this which will help in the absorption of iron from the beaten rice! A very unique dish to try would be Baked Poha made by combining curds, poha, rava, lemon juice and coriander together and baking till cooked. Adding crushed beaten rice to Arbi Subzi also provides a mild taste and a slight crunch which is pleasant to the palate. Poha can either soft or crisp depending on the way it is cooked. The most famous dish to get nice, crispy poha is Chivda. Whether made with thin beaten rice, like a salty-sweet crispy Papad Poha or made with thick beaten rice, like Jada Poha Chivda, it is the ideal snack in every Maharashtrian home and gets eaten on the regular. And the best part? It can be stored for days! So make a large batch whenever you make it! Combining poha with ragi and other vegetables will not only make for a very nutritious and delicious Poha Nachni Handvo , but will also earn you points for innovation! As we already read above, Idlis can be made with poha, which you can even stuff with veggies to make Veg stuffed Idlis. 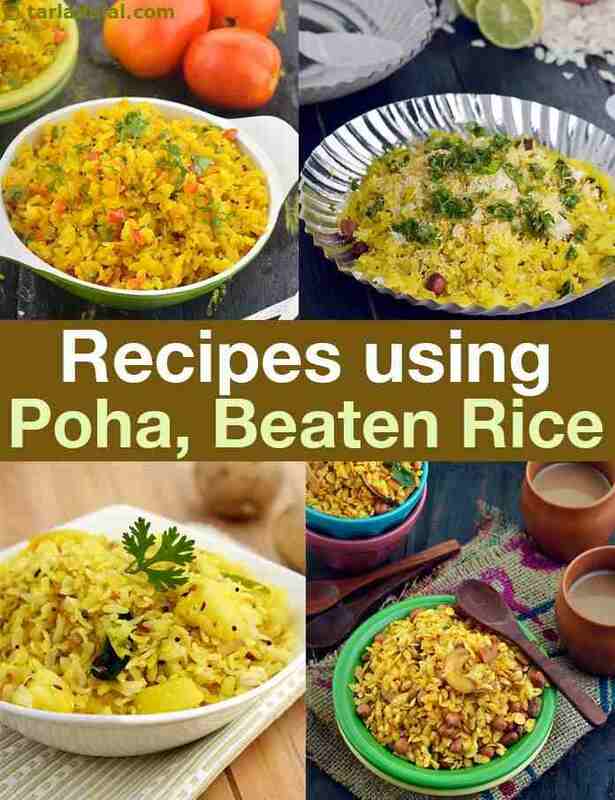 We hope you enjoy our Poha Recipe Collection, beaten rice recipes given below.